CLUE (tool for Clinical Laboratory data Understanding and knowledge Extraction) is an advanced software tool for laboratory data analysis and knowledge extraction without the use of a-priori medical knowledge aiming at the improvement of laboratory and medical practices and the support of physicians in the generation of diagnoses. The tool exploits the availability of large medical datasets, deriving from the developments in the ICT framework that makes medical information more and more organised, allowing also the application of automatic data analysis tools. CLUE can analyse medical data belonging to hundred thousands or millions of patients. 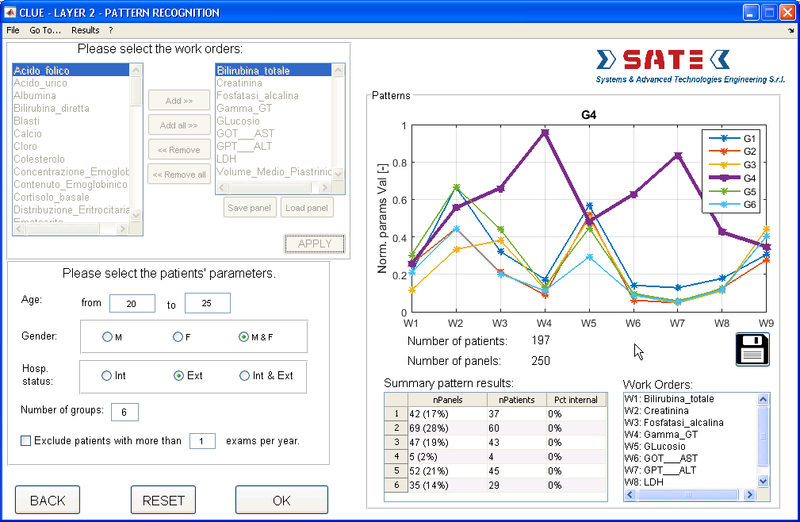 This may improve both factors affecting clinical diagnosis of laboratory data because, on one side, they may enable continuous update of the standard medical thresholds through a much wider statistical basis and, on the other side, they may also help physicians interpreting the results and evaluating correlations among them, through advanced data mining algorithms. CLUE may enhance significantly the quality of health services, improving the overall quality performance of the laboratory analyses and the reliability of the diagnoses, which, eventually, translates into economic benefits to the sanitary structure and to the patients. Indeed CLUE may help physicians diagnose the patient status in a more efficient way, avoiding useless and expensive laboratory tests and identifying more quickly the correct pathology and possible treatment, increasing also patients’ satisfaction. Statistical analysis allows performing analyses aiming at updating the standard medical thresholds used in medical practice. Patterns recognition aims at detecting meaningful groups of tests with no use of a priori knowledge and associating to them clinical diagnoses. 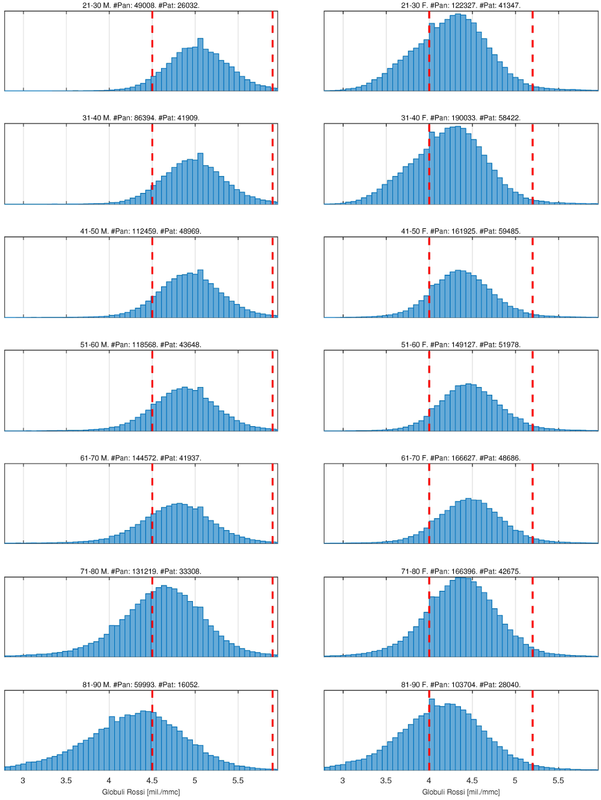 Display the distributions of different subsets of the entire dataset (e.g. distinguishing between gender and hospitalization status), for customizable age ranges. Display the computed thresholds (customizable percentiles) for the customizable age ranges. 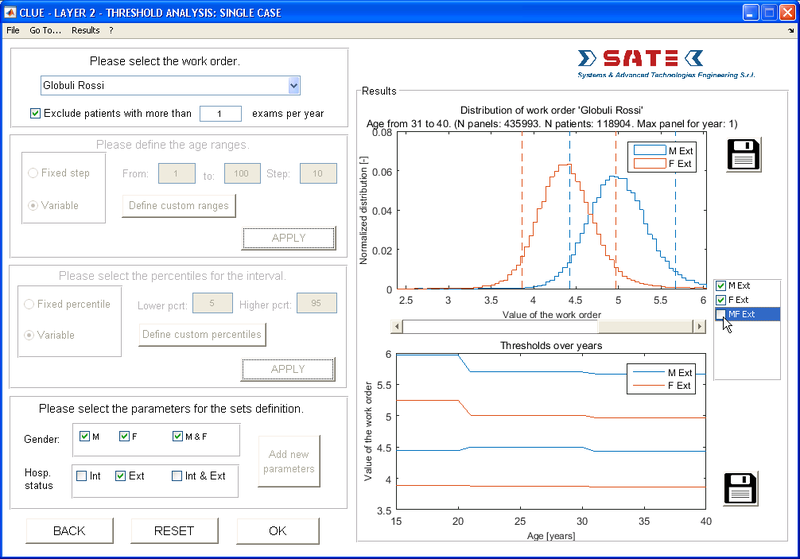 This makes possible detecting if there are significant variations for different ages and subsets of patients. Perform a correlation analysis in order to evaluate if two different tests are correlated between each other and analyse if the “anomalous” values (out of the thresholds) of one test are correlated to “anomalous” values also of the other one. Automatically compute the standard medical thresholds for several tests. The use of CLUE software may enable a much better qualification and a continuous update of the standard thresholds than the broader statistical analysis used so far. This is in line with the emerging need of personalizing clinical pathways, because it enables tailoring the standard medical thresholds taking into account not only gender and age (as it is usually done in medical practice) but also a variety of factors e.g. geographic location, race, etc. The pattern recognition allows applying data mining algorithms in order to extract knowledge from data without using a priori medical information. 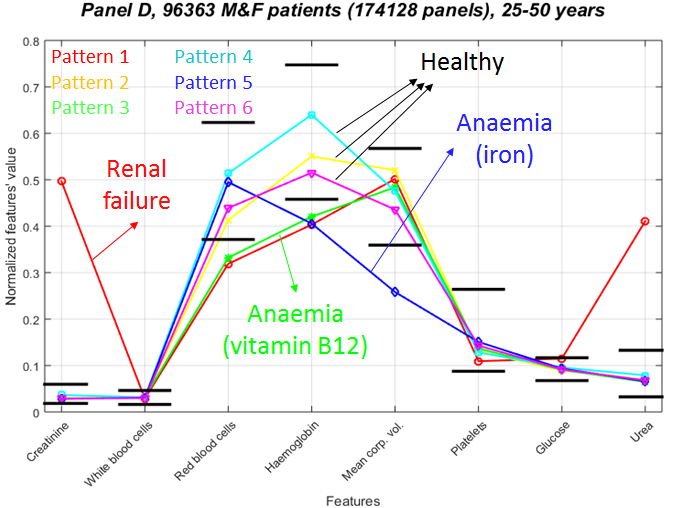 In particular CLUE identifies significant groups of patients (identified by patterns) with similar medical conditions to which medical doctors could associate specific diagnoses. Automatic pattern recognition performed by CLUE allows grouping patients with similar medical conditions. These validated patterns can then be used for automatic diagnosis i.e. by associating a new set of measurements to one of the validated patterns to which a specific diagnosis can be associated. This may allow automatizing (i.e. 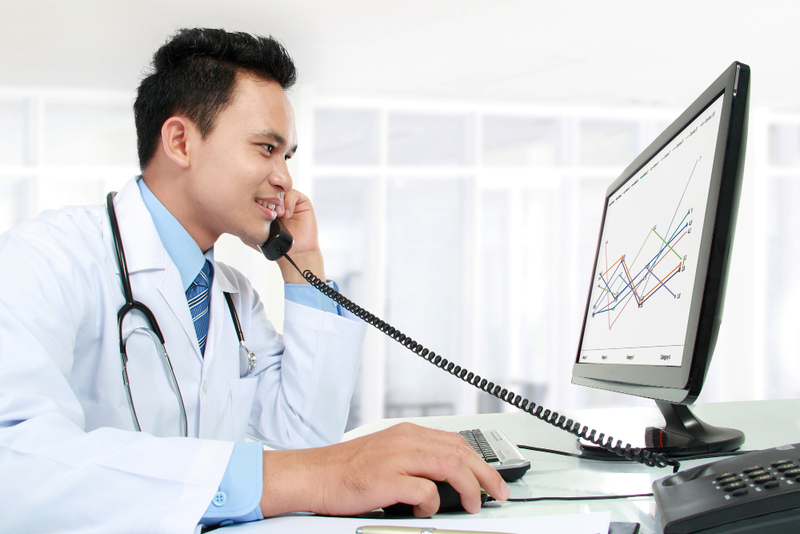 improve the efficiency of) the interpretation of laboratory data generating suggested diagnoses based on the medical knowledge extracted, requiring little effort by physicians to configure the system. Moreover the adoption of CLUE may help enhancing laboratory data interpretation and pathology characterization by physicians, allowing also sharing the extracted medical knowledge among them. Example of validated patterns extracted by CLUE with real data. CLUE has been developed following a study carried out on behalf of ESA (European Space Agency) in collaboration with Azienda Unità Sanitaria Locale Modena (AUSL MO) - Dipartimento di Ingegneria Clinica. The view expressed herein can in no way be taken to reflect the official opinion of the European Space Agency.